Everyone knows that when trying to gain new clients, the first impression is crucial. If you present your company using cheap cover materials and dusty samples, the likelihood that they will choose you as their supplier is very low. But when you use quality products to impress them at first-glance, then you have conquered the first step in gaining a new customer: making the perfect first impression. For every new presentation to a potential client you will need a way to bind and present your compelling paperwork, information sheets, pricing, etc. to make it easy to read, follow along and understand what is being discussed in your meeting. For this reason, customized presentation covers are the best place to start. Now that you know where to begin, ask yourself how you want the company to be presented. Do you want to be seen as environmentally conscious where bright colors and pizazz are secondary in importance to being “green”? Or do you want to stand out as a high-end company who can shock and awe with their presentation and marketing materials? Once you figure out how you want to brand yourself or your company for a particular client, find the best cover below to go hand-in-hand with your selection. First, let's check out some of the premium ways you can present your business with these upscale report cover options. Buy don't let the word "premium" scare you away if you have a smaller budget; several of these options are incredibly affordable and offer an awesome bang for your buck that will pay off quickly. Pinchbooks are a great way to create premium presentations, without the need for high minimum orders, outsourcing costs or lead times, and without the use of any machine. They are a new innovation that features a patented spine that makes binding pages easier and faster than ever -- in fact, you can bind your hard covers as fast as about 5 seconds each. And again, this is all by hand with no expensive equipment investment needed. You can use them to make stand-out hard cover presentations for clients that look expensive (but are not! ), for photo books, for internal financial reports, and so much more. Plus, they are sold in small boxes of just 5 or 10, depending on the size, so you don't have to buy in bulk (but we do offer bulk discounts if you do!). They come in several colors, either a cloth or faux leather material, and in many sizes from as small as 4" x 6" up to as large as 12" x 12". Coverbind hard covers will work with your Coverbind thermal binding machine, and come in many varieties including a basic hard cover, a hard cover with front window, and a customizable hard cover that you can products in-house with any standard printer. With these unique hard cover binding machines, you can produce on-demand covers for individual clients, or bulk covers for mass production. Vinyl covers are a soft and flexible cover, however, have a touch of rigidity to them and offer the look and feel of leather with their textured surface. They are a thick 15pt material and available in several professional, rich colors, including black, navy blue, green, maroon, white, and more. You can order them plain in packs of 100, or you can have us customize them to really make an impression -- choose a foil stamp of your company logo or printing of your logo and contact info...choose a custom window to show your first page, or a custom size. The options for customizing vinyl covers are pretty endless with our premium equipment, so give us a call at (866)537-2244 (866)537-2244 to discuss your needs and to get a price quote. Now let's dive into a way that you can appeal to your client's green side with some eco-friendly presentation cover solutions. They are made of several different material options, including paper, poly, and other environmentally conscious materials. Paper covers come in several options, two of the most popular choices being a textured linen and a sturdy grain embossed texture. Both offer a very classic look, and can have cut-out windows, be embossed, be foil stamped, or be printed on. They come in several colors, and can be cut to any size you need, including with square or round corners. Information on customized covers can also be found here. Poly covers are made of a unique plastic composition that can be eco-friendly, depending on what kind of poly you choose. There are polyethylene and polypropylene options, both of which come in clear or opaque cover options in many colors. They can be flood coated, half-tint printed for semi-translucency, custom cut to any size, have windows, and so much more. The options are limiteless. Chip board covers are made of, well...chip board! This is a 100% recycled product that varies in color from gray to brown, and is also recyclable to be re-used yet again. They can be printed, debossed, foil stamped, and cut to any size you need. They are popular for eco-friendly business cards, as well as presentation covers as a way to plainly show your clients that the environment is important to you. Presentation matters -- it matters BIG TIME! Let us help you create your own truly unique Customized Presentation Materials to help you gain new clients by making a great first impression. 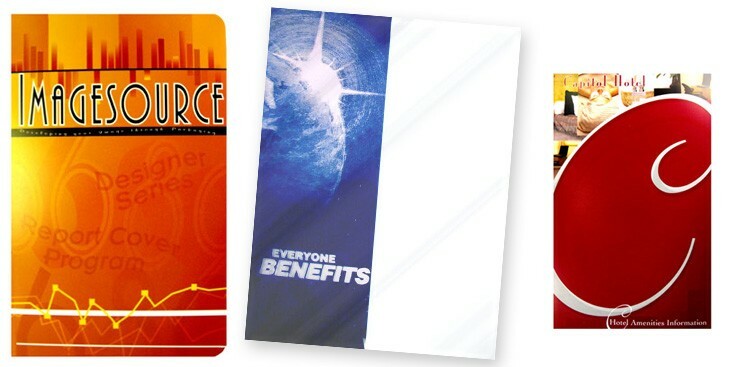 We also offer custom pocket folders, tab dividers, ring binders and more! Call our awesome sales representatives at (866)537-2244 (866)537-2244 for a quote today.